This is for Windows 10 but will probably work on other Windows versions too. Windows 10 is still relatively new so some vendors (looking at you Lenovo) haven’t updated the drivers. For example in my case I had problems with Conexant driver for Windows 10 – microphone didn’t work in some programs. To make the long story short, I tried everything and the solution was to uninstall the driver and use older version. The problem was, Windows 10 kept reinstalling the latest driver! The solution was this: Install Microsoft tool that “hides” specific driver form Windows so Windows doesn’t “see” it and doesn’t update/reinstall it. Uninstall or rollback the problematic driver until you have the one that works. Note: I am linking to Microsoft site and not directly to file download so you can be sure that there isn’t some virus or some malware file on the link. Click Hide Updates, like on photo below. You will see a list of drivers. Select the driver you want to hide from Windows update and Windows will not update this driver anymore. Click next, wait and that’s it. 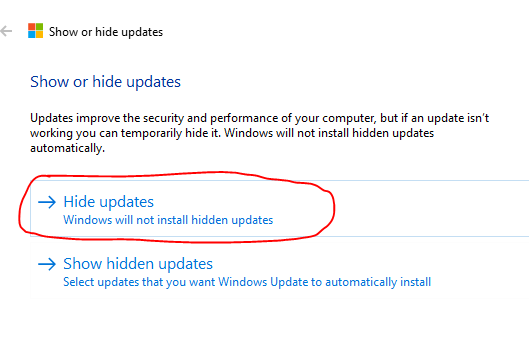 If you want Windows to update the driver again, the run this tool again and select “Show hidden updates” and then remove the hidden driver.